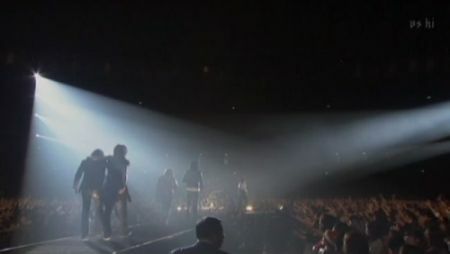 Just watched the reunion concert of Luna Sea. Oh god, it made me so emotional and not almost, but I’m definitely crying. I can’t say how happy I am. Finally, after the long 7 years. 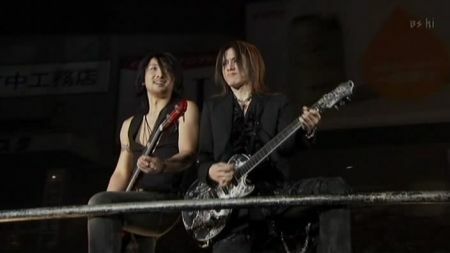 It’s like a dream come true, seeing Luna Sea together in a concert once again. the concert was aired by NHK and someone is nice enough to share it in torrent. I tried to download it but I stopped, knowing that download it with my internet connection is like stopping my dream from coming true lol. But I’m not giving up yet, I contacted my friend via yahoo messenger and asked him to download it for me knowing that his connection is fast like hell^^. He downloaded it and he brought it to my house(what a nice guy…^^. ) and I finally I get to watched it. The concert last for 1 hour and 58 minutes, if I’m not mistaken. 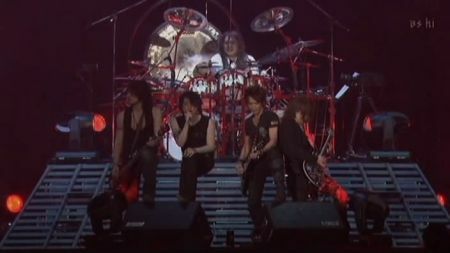 Luna sea played all of their legendary song and sadly, there is no new songT_T. But, not all the song is shown in the live version of NHK, so the concert might last longer than what I have watched, maybe in the DVD later. I want to review all of the aspect in the concert. But I never have enough time and there is many college assignment waiting for me, so I’m just going to review the best aspect that I have seen in the concert. First best thing is The opening of the concert. The songs are Loveless and Dejavu. Loveless seems calm but at the same is preparing you for the ‘true’ opening, the “Bang! 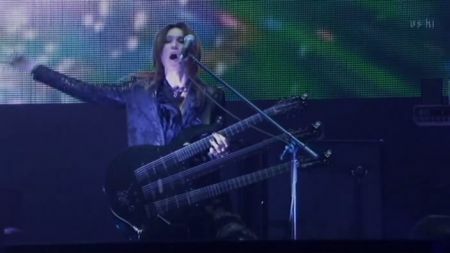 !” begins with Dejavu, the smoke, the lightning and the best part is Ryuuichi’s scream at the beginning of the song. It really gets the Tokyo dome shakes in the spectator’s scream. 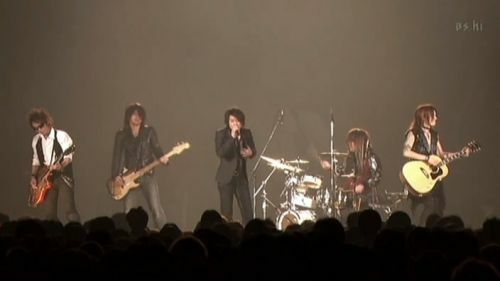 Second best thing is when the band moving to center of the Tokyo Dome and singing Breathe in Acoustic. It’s like seeing them walking their path of glory for many years. It’s just the feeling I get when I see this. 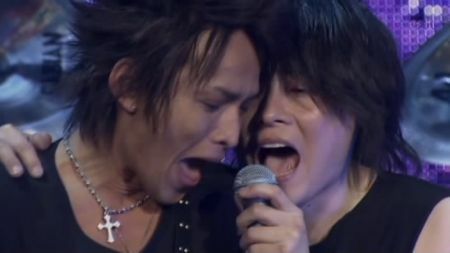 It’s also the first time I have seen Luna Sea performed in an ‘acoustic’ kind of way. Its going to be memorable in my heart. Moving on, Rosier part is definitely the best. 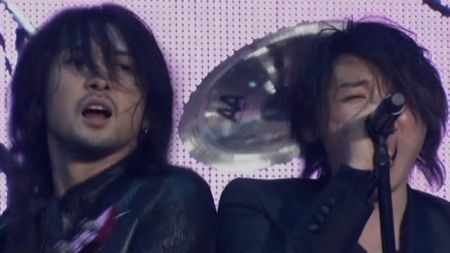 Especially the part where J sing his poetry and throwing the mic far behind him, It’s what you called ‘Gakkoii’^^! Moving on again until the last part of the concert, where Precious… played and exactly at the part where all the members gathered in the center of the stage. Really nice! At least, the most sad part is when it’s coming down to the last song ‘Wish‘. This moment at the first time I watched it, I cried…and I mean that I’m really cried like I was crying my heart out. When the people starts to scream “I Wishhhh!!! !” at the beginning of the song, I just couldn’t hold it. A happy feeling to be able to hear luna sea again and the feeling that the concert is over were mixing in my heart. I hope this reunion didn’t end in this concert. Because many fans like myself are expecting something new from them. Maybe a single or two:p, a whole album will be the best. 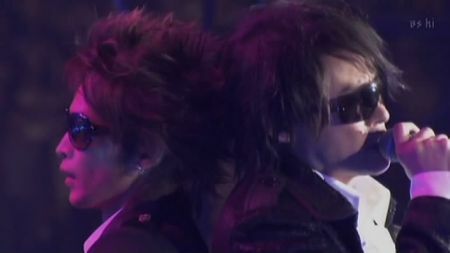 Although maybe it will be hard for a full come back, because everybody in Luna Sea is busy like hell. But, I hope they will reconsider it for their fans who loves them. 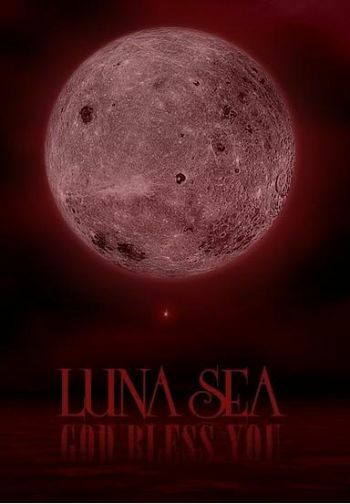 All my love for Luna Sea. Thanks for many beautiful moments you shared with us and many beautiful moments yet to come, We always hope in our heart! !